Service Ministries | "Weddings with Integrity"
Cynthia wrote – I am looking for a rural location for my wedding and reception in NE Illinois. Any suggestions? There is a relatively new venue called The Mora Farm in Waterman. This is a remote location. In fact you will find it is accessible via dirt/gravel roads. I have officiated a few weddings at this venue and found the couples were quite happy with their experience. They have a FaceBook presence but on the date of this posting, their website was not working. You can reach them at (630) 201-1333. I hope this helps! This video is provided by Mr. and Mrs. Schulten. I officiated their wedding at Shannon Hall earlier this year. The video provides a view of the couple on the steps of Shannon Hall and a bit of the interior. (The reception footage was not recorded at Shannon Hall.) If you are looking for an economical yet traditional church setting, this former site of Holy Cross Church may be worth checking out. 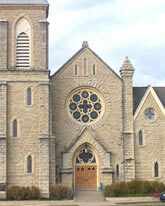 While the exterior is quite impressive, the interior is not as traditional as Century Chapel or Chapel on the Green. Operated by the Batavia Park District, this facility is available for rent by the hour. Here is a link for rental information. Yorkville - The Chapel on the Green is again available for events. You may find this chapel to be a more affordable alternative to other wedding venues in the far-western suburbs. After the Kendall County Historical Society divested its interest in this historical site, a not-for-profit organization was formed to reopen this quaint white church. The Chapel on the Green is now operated by the Chapel on the Green Historical Society and can be rented for weddings, baptisms and other events. The lower level is also available for receptions and events. The Chapel on the Green was built in 1855 and is the oldest church building in Kendall County. The restored pipe organ dates back to 1899. The bell in the bell tower works and can be rung as the bride and groom exit the chapel. 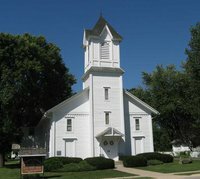 The Chapel on the Green is located at 107 West Center Street (corner of Church and Center Street) in Yorkville, Illinois. Here’s something you can share: We got married a month ago in an outdoor setting. Concerned that it may be a little warm on the day of the wedding, we decided to provide bottled water for our guests. At the “entrance” for our guests, we placed two tubs filled with ice and bottles of water. We also made hand-held fans out of cardboard and wooden handles. The fans had our engagement picture printed on them. Carrie, thanks for sharing the idea! Yes, is the shortest answer. However, I think most view the presenting of the bride as nothing more than ceremonial tradition. No legal or tangible “transaction” actually takes place. So, it really doesn’t matter if the “Who presents…” question is asked – unless dad has been anticipating this moment for a number of years – then you may want to weigh the question against the possibility of hurt feelings or disappointment. Corrine – This is what I typically see with most weddings: Couples secure a place for the reception and wedding, next they search for a qualified officant, then entertainment and other supporting vendors. Now would be a good time to begin the process. I have weddings on my calendar that are more than a year away. Securing your officiant early can help you avoid settling for second- or third-choice. Most couples I encounter seem to target a 9-12 month time frame for securing an officiant and other vendors. I hope this helps. I saw your posting titled “Faux Marriage” a while back. Just thought I would mention I saw another article on a marriage being declared invalid. The article said the Judge declared it “Void ab initio”, meaning the marriage never existed. The couple was married by an internet ordained minister. It’s too bad that folks get the wool pulled over their eyes by fake wedding officials and have to go through all that hassle. Jan wrote: My sister is getting married in 2012 and talking about having a coworker officiate the marriage. She says he ordered his license online and is willing to do the wedding for free (if it’s open bar). I didn’t think this was legal. Is it? This is a good question Jan. I’ll attempt to answer it, and then raise one of my own. 5) an officiant performing the marriage in accordance with the principles of any religious denomination, Indian nation or tribe or native group provided that when such principles require an officiant, the officiant be in good standing with his religious denomination, Indian nation or tribe or native group. Even if you could stretch things a bit and say that the fee-paid “ordination” met the qualifications for a), you may have some difficulty with b). The question of being legally authorized to perform a marriage not only extends to those with illegitimate credentials, it also extends to those attempting to convince couples that they serve as a Justice of the Peace (class 4?). This is even more misleading than the “clergyperson” with fake credentials. The fact is, Illinois abolished the office of Justice of the Peace effective in 1964. My suggestion would be to stick with someone legitimately qualified to perform a wedding – a Judge, Cook County Clerk, or clergyperson with legitimate credentials. Why would a couple place so little value on their marriage that they would have it begin with an illegitimate officant? Linda wrote: I am looking for an unusual (but nice) location for my wedding. Mark and I would like our wedding and reception to be somewhere in the Evanston area. Any ideas would be appreciated. 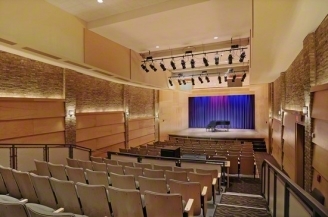 Linda, here is something to check out… I recently received an email from a venue in Skokie that was intended to bring better awareness of the Skokie Theatre as a consideration for a wedding venue. While I have not seen a wedding at this location, they claim to have experienced a 1.5 million dollar renovation back in 2006. The photo reveals the interior to be a little different than, say, the Rialto Square Theatre in Joliet. They say the theatre seats 140 with 4 wheelchair spaces. This sounds like a different sort of a wedding venue.